After being a model prisoner for five months, I was released one month early for good behavior, and wound up back in my infantry outfit. This time being back in the infantry wasn’t as bad as it had been before. By being in the stockade I had achieved some kind of status as one of the really tough guys, and nobody bothered me. This was especially true of the new men who had joined the outfit while I was away. They heard stories about me, probably untrue ones, and believed them. I was a myth come to live among them. The field exercises I now handled with ease, and there was really nothing about soldiering that was all that unpleasant. I even thought about making the military my career, but I did not want to remain an enlisted man. I wanted to be an officer. However, as a former jailbird that was out of the question. After several months of running around in the jungle, my discharge papers came through, and once more I found myself on a ship, this time sailing for New York, and once again I was seasick the entire trip. Now I was a civilian and back in New York. My priorities were finding a place to live and finding a job. I was a high school graduate with an honorable discharge from the military, with no friends or connections, so that the whole thing was somewhat problematical, although I did plan to return to college. My first home upon coming back was a furnished room on East Broadway. I scanned the newspaper “wanted” ads, and came up with a job as a waiter at a Shrafft’s Restaurant, at a wage below minimum. Shrafft’s (and this Shrafft’s in particular) was an interesting experience. I believe that Shrafft’s is now defunct, but at the time it was a successful chain of restaurants all over New York City, run by a man named Frank G. Schattuck. The entire staff of all of these restaurants was ancient Irish ladies, who were grateful and loyal to Mr. Schattuck because during the Great Depression he hadn’t fired any of them. There were male bartenders in the restaurants, who would serve you either a martini or a sundae where it was not unusual for mom’s to bring their children. The bars were important not only to Frank Schattuck, but to everyone who worked there, as alcohol seemed to lead to better tipping. 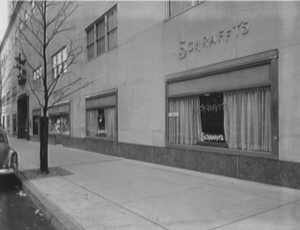 Unfortunately, my Schrafft’s was located on the southwestern corner of Madison Avenue and 51st Street (I believe there’s a Hallmark store there now), only one block from St. Peter’s Cathedral. This meant that we had no bar, and our most regular customers were a host of elderly ladies on their way to or from St. Patrick’s. They came in, sat at tables, ordered tea and toast, sat forever over these items, and then left us a nickel tip. I should mention that there was only one other waiter working the tables there, and he was also Jewish. It would seem that Mr. Schattuck was working on integrating his workforce in those days. It didn’t take us long to figure out that this was not the road to fame and fortune. One Response to Return to the U.S.